December 5 marks International Volunteer Day, and the theme for this year is “Volunteers Build Resilient Communities”. CatholicCare is blessed to have a terrific group of volunteers who live out the message of building stronger more resilient communities through their generous service. CatholicCare has volunteers working across many of our programs and services, and one in particular is the After School Learning Support Program which serves the Burmese Refugee Community in the Western Suburbs of Melbourne. This innovative learning program has now been running for eight years, and it couldn’t be kept alive without the ongoing support of volunteers. CatholicCare’s Refugee Settlement Program equips newly arrived refugee and humanitarian entrants with the social and life skills necessary for successful integration into Australia. Refugees are often vulnerable and face multiple barriers including mental health challenges, unemployment or economic disadvantage, language barriers and social isolation. The After School Learning Support Program aims to provide Primary and Secondary students from Burmese refugee backgrounds with a supportive environment to enhance their schooling achievement. The program also supports the parents of these children, with a cooking class and conversational English. The program is facilitated by our volunteer tutors who support the students in Maths, English and Social Skills - assisting the students to remain engaged in school, build resilience and social connectedness, and pursue their educational goals. 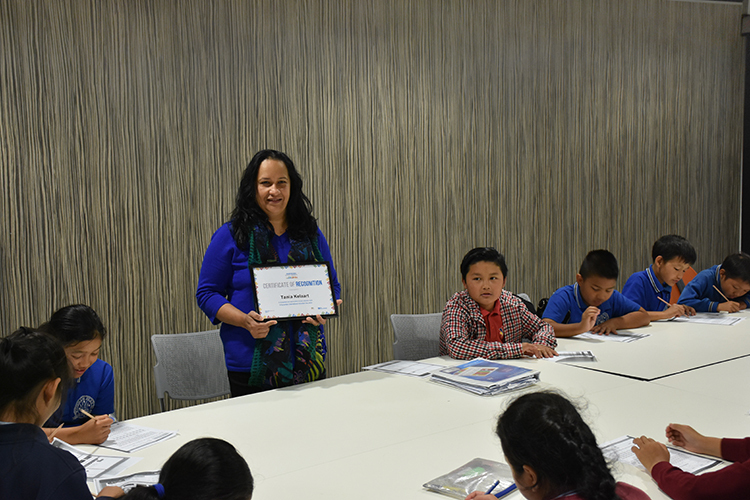 For International Volunteer Day this year, we introduce Tania Kelaart – who has been a volunteer tutor with the program for the past five years. Photo: Tania Kelaart with students in the After School Learning Support Program. Tell us a little about yourself and why you got involved in volunteering with CatholicCare? I have been volunteering as a tutor with the Refugee After School Learning Group for five years now and I’ve always been passionate about working with people in the community. As a Catholic, my faith and values are integral to my volunteer service with CatholicCare. Migrating from Sri Lanka myself has helped me to understand some of the difficulties and instability the children face, particularly around their schooling and education. I believe inputting into the children’s lives in this way, is a good and worthy cause. Carrying the spirit to serve others is important to me. What’s involved in your role as a Tutor? Preparing and setting up for the tutoring lessons, supervising and assisting the children in their learning in Maths and times-tables, English and language skills. Also, teaching them about values and life skills, such as the importance of showing respect and learning to listen to each other. What age group of children do you work with? Primary school children, boys and girls in grades three and four. There are approximately fifteen children in my group from different local schools – many are from Wyndham Park Primary and Woodville Primary School. What are some of the positive impacts the learning group is having on the students and their families? There have been many positive things I have seen and experienced from the tutoring group. We have received direct reports from one of the schools, where teachers have made comments about the student’s improvement in their learning and schoolwork. I have helped some of the children learn to make the most of their class time and have seen an increase in confidence in their learning, concentration and attention skills. I have also seen friendships form and positive social interaction among the students and their families. The theme for International Volunteer Day is “Volunteers Build Resilient Communities”. This is about recognising how volunteers contribute to building more resilient communities in the face of adversity and hardship. Can you share an example of how you have seen this program build resilience among a student or family in the Burmese community? Language is a significant barrier for refugees, and learning a new language requires a significant degree of resilience. One child’s mother was very withdrawn and lacked confidence due to the difficulties with language and cultural barriers. After improvement with her English and adjusting to her new environment, I saw her transform into a confident person who started running a successful child care program. I also saw one of the boys in my group who was very disruptive and unsettled at first, after persevering he became settled and he engaged positively in class and in his schooling. How has your volunteer experience benefited or enriched you personally? I love the kids and enjoy working with them and supporting them with their schooling. However it’s not without its challenges as it can be difficult at times. At the Community Centre we have created a homely atmosphere where the children and their mothers feel welcome and comfortable. The children are great and they always put a smile on my face. In what ways have you felt fulfilled and valued in your role with CatholicCare? I do feel a sense of fulfilment and appreciation in my role as a volunteer. One example is teaching some of the children to tell and read the time, and then seeing their faces light up when they have achieved this skill. Also feeling free to contribute, give feedback and make suggestions for improvement makes me feel appreciated. Results derived from a recent Volunteer Survey taken from a quarter of our volunteer base, revealed CatholicCare volunteers experience high levels of support, appreciation and satisfaction in their work. These are encouraging results, showing the value we place on our volunteers and the level of positive morale among them. As demonstrated in our interview, volunteers like Tania make such an important contribution to the work and mission of CatholicCare. International Volunteer Day marks another occasion to recognise all of our volunteers and say thank you. To all our volunteers at CatholicCare, thank you for another year of great work and we wish you a peaceful Christmas and a safe and prosperous new year! We look forward to continuing to partner with you in 2019.